Sometimes the weight of the world can seem overwhelming. But occasionally, if we're lucky, YouTube presents us with videos of adorable canine activities to ease the pain. If you're feeling down, spend a minute and a half with Geronimo the Dog, a.k.a. Double Dutch Dog. Geronimo isn't your average pooch. In addition to possessing camera-ready charisma, Geronimo can jump a mean rope. And we're not talking standard jump roping; we're talking double dutch jump roping. 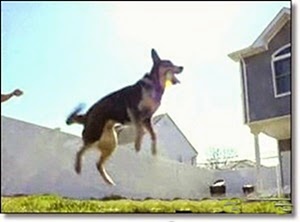 So heat up some popcorn, sit back, relax, and marvel in the wonder that is Geronimo the Double Dutch Dog.